The recent waves of strike action by Junior Doctors across England have seen large picket lines at York Hospital, with up to 100 strikers and supporters on a single day. Amongst the support shown, cavalcades of City Council vehicles and even a visit from a local fire engine. Local BMA members have held ‘meet the public’ events in town and volunteered to teach first aid and baby life-saving courses across the city. 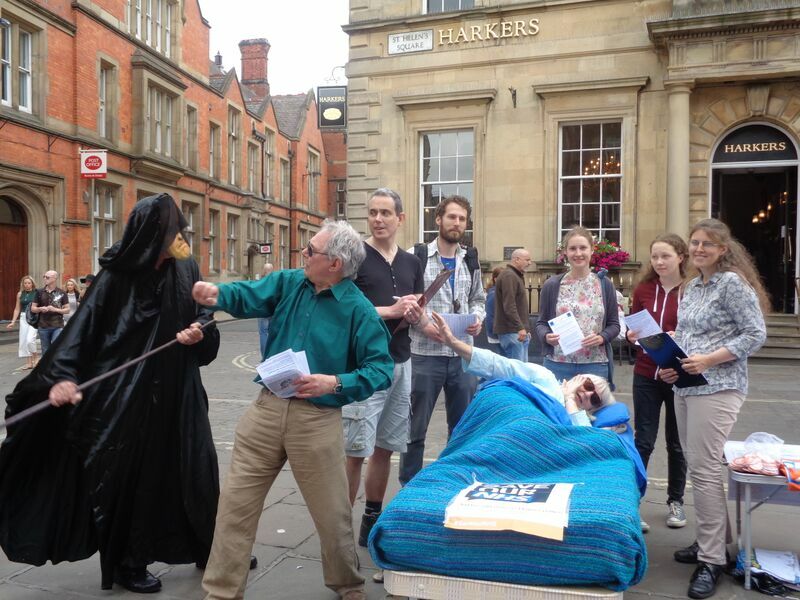 Citizens of York beat back the Grim Reaper as he attacked the NHS. To mark the NHS’ 67th birthday, Defend Our NHS York staged a dramatic scene in the city centre, complete with patient in bed, whilst local MP Rachael Maskell looked on. There were leaflets for the public to take away. The Grim Reaper turned out to be none other than Jeremy Hunt! 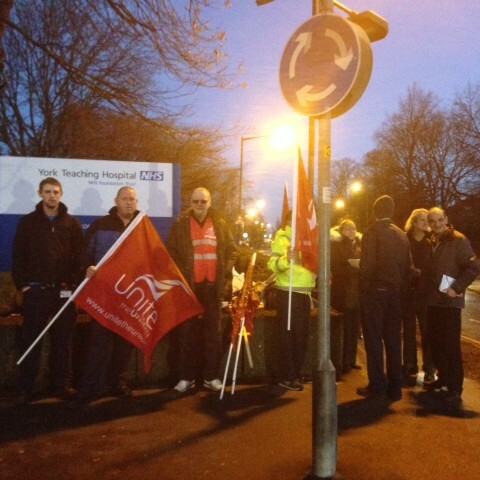 As the sun crawled (slowly) above the horizon on Monday, staff from across York Hospital’s departments walked out for a 4 hour strike. Amongst those taking part were midwives, pharmacists, radiologists, clerical staff and more. Its been revealed that less than half of staff will receive even the derisory 1% pay-rise currently on offer. They were met by supporters joining them to demand an end to poverty pay in healthcare.